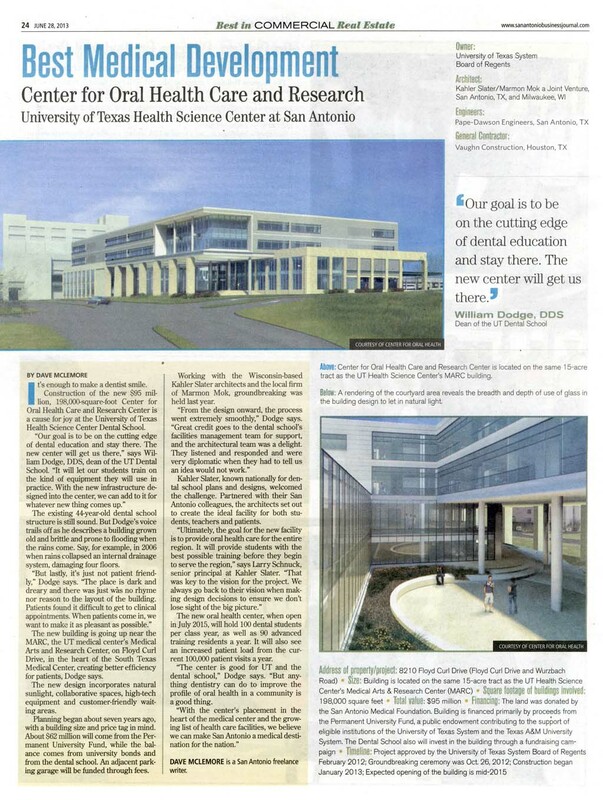 The Center for Oral Health Care and Research is the future of oral heath care education, training and patient care for the Dental School at the UT Health Science Center San Antonio. This new facility, the first for the Dental School since the current building was opened in 1972, was approved by the UT Board of Regents in February 2012. Things have moved quickly since the spring as the Center is scheduled to open to students and patients in July 2015. The Groundbreaking was celebrated on October 26, 2012, with over 150 students, faculty, staff, alumni and local practitioners on hand. Please visit the link below for more information about the groundbreaking, including photos and a video of the ceremony. Within the walls of this soon-to-be built facility, the Dental School will bring to our state and nation improved dental education, training and care. This facility will allow our faculty to train dental students and residents in a modern and technologically advanced setting that will be most like where these students will practice in the future. It will also allow scientists to conduct research in state-of-the-art laboratories. The building will facilitate clinical research trials that, in turn, will generate great advancements in innovation and patient care. Finally, this new Center for Oral Health Care and Research will enable our Dental School to sustain its top-tier ranking in all areas of education, research and patient care. For questions about the building or to learn more about naming opportunities within the Center for Oral Health Care & Research, please contact Sara Piety, Dental School Director of Development at piety@uthscsa.edu or (210) 567-6536.